MO Peeps, a C-A robotics team, perform a skit they will present at an international competition next week, to get the word out about their efforts to replace Styrofoam food trays with compostable ones. The robotics students have written a book (at left) to report their research findings. FLINT TWP. — Paper or plastic? For a determined group of middle-school students, that environmentally-conscious question goes beyond bagging choices at the grocery store. 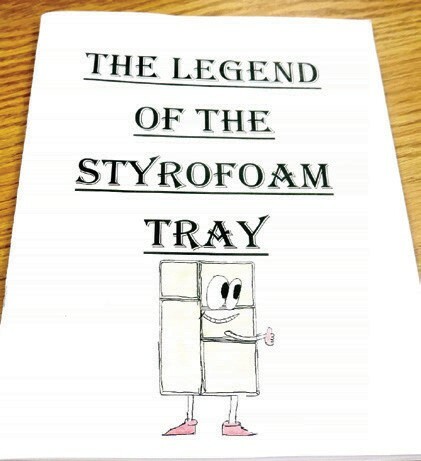 They are on a mission to educate the public and gain support for removing Styrofoam food trays from their school cafeteria by 2017 and replacing them with a cardboard-like compostable tray. Collectively known as MO’ Peeps, the First Lego League (FLL) robotics team members are Jerianne Ingram, eighth grade; Parker Oosterhof, sixth grade; Lydia Minzey, sixth grade; Caleb Rose, 7th grade, and Ainsley Vanderhyde, sixth grade,, all students at Carman- Ainsworth Middle School and Brayden Raether, a seventh grader at Goodrich Middle School, whose mother teaches at Carman- Ainsworth. 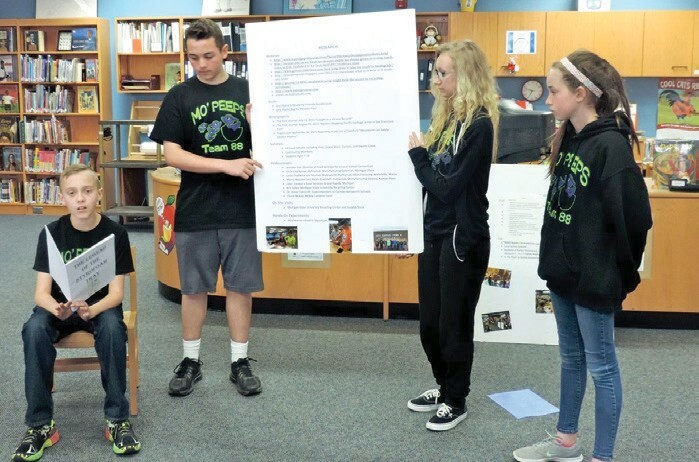 As a research project for Trash Trek, the Challenge theme of this year’s FLL robotics competition, the team had to identify a real world problem related to the theme, create an innovative solution and share their research and solution with others. The students did extensive research to demonstrate the environmental hazards of Styrofoam. Scientists estimate that Styrofoam takes 1,000 years or more to decompose in landfills, Jerianne said. Lydia, Ainsley and Brayden added that Styrofoam is a neurotoxin that seeps into the water supply, gets eaten by fish who pass it back to humans when they eat the fish, potentially causing severe health problems. The fish poisoning is a big deal in Michigan given that the Great Lakes are its largest water source, they said. Based on their findings, the students began looking for ways to remove or limit the amount of Styrofoam that winds up in landfills. That included conducting a survey of 18 school districts in Genesee County which concluded that 17 of the districts use Styrofoam trays in the school cafeteria. C-A schools, which is a normal-sized district, uses about 5,000 Styrofoam trays per day, Parker said. Add in that same amount from the other 17 county school districts also using Styrofoam and that leads to about a million trays each year that end up in the landfill to sit for hundreds of years before decomposing, he said. The students’ research led to information about a compostable tray that only takes about eight weeks to decompose in landfills. Next they set out to persuade the local powers-that-be to switch from Styrofoam to the compostable trays. The students hope to establish p a local alliance similar to one created in 2013 by several of the largest school districts in the United States including New York City, Chicago, Los Angeles, Miami, Dallas and Orlando. Those districts formed an Urban Food Alliance to bulk purchase compostable trays from the Huhtamaki company, which also makes an array of paper products including Chinet plates and has 17 plants nationwide including one in Michigan Besides making a pitch to the C-A superintendent and school board to switch to compostable trays the students said they worked with Jennifer Yee, food director for the C-A, Swartz Creek and Flushing school districts in hopes of developing a bulk buying and storage plan for the compostable trays. That effort fell short because of financial management issues although the compostable trays bought in bulk cost about the same as Styrofoam ones, they said. The students also sought help from state elected officials who suggested they mount a public awareness campaign to get parents, environmentalists and other concerned citizens onboard with their goal to replace Styrofoam trays with compostable ones at all schools in Genesee County. The students said they won’t stop trying to reach that goal even if takes longer than the current robotics season. 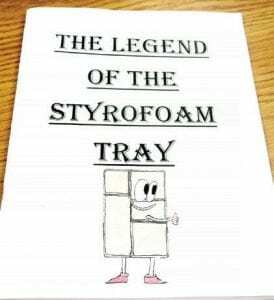 They have compiled their findings in a book called “The Legend of the Styrofoam Tray,’’ which they have presented to some local audiences. They also have incorporated their findings into a skit which will be presented next week at an international robotics meet in Carlsbad, California, May 19-22. MO’ Peeps earned a trip to that invitation only tournament by finishing third in the state FLL robotics competition. MO” Peeps won the world robotics championship in 2009 and have a case full of trophies on display at Rankin Elementary School to show their accomplishments. Now they are seeking public support to replace Styrofoam food trays in school cafeterias. “If people in the community don’t like the idea of Styrofoam sitting for a thousand years in the landfill, they are the ones who can get things changed,’’ said Leanne Welch, MO’ Peeps robotics coach.